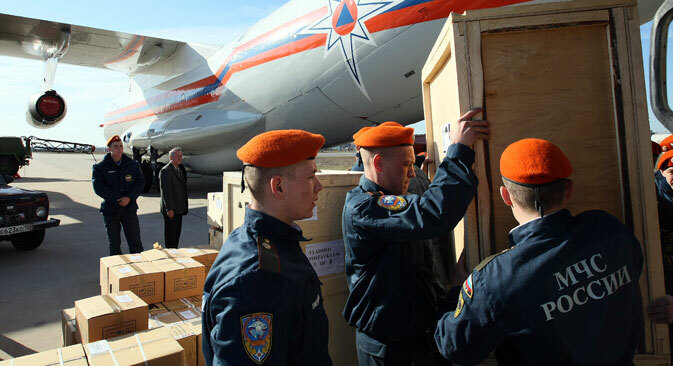 Personnel of the Russian Emergency Situations Ministry loading humanitarian relief aid, namely, medical equipment, food and personal hygiene products aboard an airplane at Ramenskoye airport. 12 rescuers from the Russian-Serbian humanitarian center in Nis have arrived in Macedonia. A team of Russian rescuers from the Ministry for Emergency Situations’ humanitarian center in Serbian Nis has arrived in Macedonia to help it cope with the aftermath of flooding overnight to August 7, sources from the Russian Embassy to Macedonia told Tass on August 10. "Twenty rescuers from the Russian-Serbian humanitarian center in Nis have arrived in Macedonia to help liquidate the aftermath of flooding in hardest hit areas," the embassy said. Rescuers have delivered pumps to pump out water. According to updated reports, 21 people were killed and 22 were injured in deadly floods hitting the Macedonian capital, Skopje, following torrential rain. Six more people are still missing. A 15-day state of emergency has been declared in the capital and the towns of Kumanovo, Kriva-Palanka and Tetovo as well as in the settlements of Aracinovo, Singelic, Smilkovci, Stajkovci and Tsreshevo.